Enjoy Best Quality Beauty Services at Your Doorstep at Affordable Rates. Beauty services at home in Delhi and Gurgaon are flourishing quite a bit these days. In fact, such mobile services are widely accepted since they save time and effort. Doorstep beauty services at home in Delhi and Gurgaon also help in saving traveling cost. One simple phone call and the services will be available within the next hour or so to meet your needs and demands. Need a massage? Want to get groomed for a dinner party? What about body polishing? All these services are now available at your fingertips. The introduction of salon service at home Delhi Gurgaon makes it possible to get the best of these services at lowest rates and that too while being at the comfort of your home. Gurgaon has become one of the busiest and most happening areas in and around Delhi. Be it the work culture or business hub, it has become a great zone for job seekers and business enthusiasts. 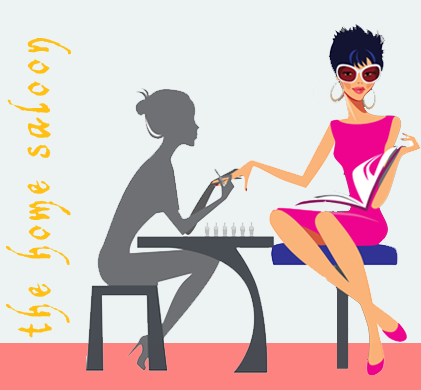 People here are busy with their work culture and hence, often find it difficult to manage quality free time for leisure activities.Since it becomes difficult for them to take care about their own selves, My Home Salon has introduced salon service at home in Gurgaon to offer them easy deals on beauty services. These premium home salon doorstep beauty services can be availed with just a single phone call. These are easy and convenient services to rejuvenate your senses. Back from a day's hectic work schedule and you need to attend a dinner party. Don't worry and give a call to this premium salon service provider. They will be available at your doorstep within the proposed time limit. "I got the L’Oreal Hair Spa done by My Home Saloon this weekend, and it was really great. Away from the bustling crowd and long queue of salons during the weekend, I got the hair spa done in comfort of my home, while enjoying my favourite movie!! The beautician was well-trained and did a great job. She gave me a wonderful head-n-back massage which was so relaxing that I almost dozed off. After wash, my hair felt soft and looked gorgeous; it was as good as a salon treatment, without stepping out! !..and thanks to the massage, I had best Sunday siesta!! :)"
"My Home Salon is definitely the best salon service at home in Gurgaon that I have availed. The professionals are highly trained and possess enough knowledge to meet my needs specifically. They also charge quite competitively." "I got the L’Oreal Hair Spa done by My Home Saloon this weekend, and it was really great. Away from the bustling crowd and long queue of salons during the weekend, I got the hair spa done in comfort of my home, without stepping out! !..and thanks to the massage, I had best Sunday siesta!! :)"
Beauty Services at Home in Gurgaon, Beauty Services at Home in Delhi, Doorstep Beauty Service at Home in Gurgaon, Doorstep Beauty Service at Home in Delhi, Salon Service At Home in Gurgaon, Salon Service At Home in Delhi, Beauty Services at Home Gurgaon, Beauty Services at Home Delhi, Salon Service at Home Gurgaon, Salon Service at Home Delhi, VLCC Gold Facial, VLCC Pedicure, VLCC Manicure Free Head N Shoulder Massage / Bleach, Threading Eyebrows N Upper Lips, Beauty Parlour Doorstep Services in Gurgaon , Beauty Salon at Home in Dlf phase 1 , Beauty Salon at Home in Dlf phase 2 , Beauty Salon at Home in Dlf phase 3 , Home Salon in Sector 54 Gurgaon , Home Salon in Sector 55 Gurgaon , Home Salon in Sector 56 Gurgaon , Beauty Parlour at Home in Sushant Lok , Door to Door Beauty Parlour Services Gurgaon, Delhi NCR , Best Wedding Makeup Artist in Gurgaon, Delhi NCR , Beauty Salon for Brisal Makeup in Gurgaon, Corporate parties, staff appreciation events, and in-office celebrations , Corporate Spa Station, Employee recognition, Merger parties, Going away parties, Sales Achievement, On / Offsite Meetings, Corporate Golf Tournaments, Office Parties, Employee Birthdays, Employee team building, Fundraising Events, Next Corporate Event, Retreat, Executive Training Session offer your Company and Clients True Renewal, Gurgaon, DLF 3 Gurgaon, DLF 5 Gurgaon, Sushant Lok 1 Gurgaon, Golf Course Gurgaon, Sector 45 Gurgaon, Sector 46 Gurgaon, Sector 47 Gurgaon, Sector 30 Gurgaon, Sector 29 Gurgaon, Sector 17 Gurgaon, Sector 18 Gurgaon, Malibu Town Gurgaon, Gurgaon, DLF 2 Gurgaon, DLF 1 Gurgaon, DLF 4 Gurgaon, Sector 5 Gurgaon, Golf Course Extension Gurgaon, Sector 9a Gurgaon, Sector 14 Gurgaon, Sector 15 Part 1 Gurgaon, Sector 15 Part 2 Gurgaon, Sector 21 Gurgaon, Sector 21 Gurgaon, Sector 22 Gurgaon, Sector 23 Gurgaon, Sector 31 Gurgaon, Sector 42 Gurgaon, Sector 43 Gurgaon, Sector 48 Sona Road Gurgaon, Sector 47 Sona Road Gurgaon, Sector 48 Sona Road Gurgaon, Sector 49 Sona Road Gurgaon, Sector 50 Gurgaon, sector 27 Gurgaon, Sector 51 Gurgaon, Sector 52 Gurgaon, Sector 53 Gurgaon, Sector 53 Gurgaon, Sector 54 Gurgaon, Sector 55 Gurgaon, Sector 56 Gurgaon, Sector 57 Gurgaon, Sector 59 Gurgaon,South Delhi, Green Park South Delhi, Saket South Delhi, Hauz Khas South Delhi, Lajpat Nagar South Delhi, Kalkaji South Delhi, Vasant Vihar South Delhi, Sarojini Nagar South Delhi, Alaknanda South Delhi, Defence Colony South Delhi, New Friends Colony South Delhi, Jasola Vihar South Delhi, Gulmohar Park South Delhi, Gulmohar Avenue South Delhi, Shahpur Jat South Delhi, Lado Sarai South Delhi, Chattarpur South Delhi, Malviya Nagar South Delhi, INA South Delhi, AIIMS South Delhi, Moti Bagh South Delhi, Vasant Kunj South Delhi, Chittaranjan Park South Delhi, South Delhi, East Delhi, Mayur Vihar East Delhi, Patparganj East Delhi, Preet Vihar East Delhi, Shahdara East Delhi, Vasundhra Enclave East Delhi, Kalyanpuri East Delhi, Pandav Nagar East Delhi, Vinod Nagar East Delhi, Laxmi Nagar East Delhi, Shakarpur East Delhi, Anand Vihar East Delhi, Dilshad Garden East Delhi, Silampur East Delhi, Vivek Vihar East Delhi, West Delhi Palam West Delhi, Najafgarh West Delhi, Dwarka West Delhi, Janakpuri West Delhi, Punjabi Bagh West Delhi, Rohini West Delhi, Hari Nagar West Delhi, Uttam Nagar West Delhi, Vikas Puri West Delhi, Mahavir Nagar West Delhi, Rajouri Garden West Delhi, Kirti Nagar West Delhi, Moti Nagar West Delhi, Pashim Vihar West Delhi, Nagloi West Delhi, Pratap Nagar West Delhi, Madhuban Chowk West Delhi, West Delhi Central Delhi Chandni Chowk Central Delhi, Connaught Place Central Delhi, Karol Bagh Central Delhi, Pragati Maidan Central Delhi, Sadar Bazar Central Delhi, Mori Gate Central Delhi, Nai Sarak Central Delhi, Connaught Circus Central Delhi, Janpath Central Delhi, Barakhamba Central Delhi, Jhandewalan Ettension Central Delhi, Anand Parvat Central Delhi, Sarai Rohilla Central Delhi, Sunder Nagar Central Delhi, Nizamuddin Central Delhi, ITO Central Delhi, Ajmeri Gate Central Delhi, Noida, Sector 14 Noida, Sector 15 Noida, Sector 15 A Noida, Sector 17 Noida, Sector 19 Noida, Sector 26 Noida, Sector 30 Noida, Sector 33 Noida, Sector 40 Noida, Sector 44 Noida, Sector 51 Noida, Sector 55 Noida, Sector 56 Noida, Sector 62 Noida, Sector 70 Noida, Sector 119 Noida, Beauty Services at Home in Gurgaon, Beauty Services at Home in Gurgaon, Doorstep Beauty Service at Home in Gurgaon, Doorstep Beauty Service at Home in Gurgaon, Salon Service At Home in Gurgaon, Salon Service At Home in Gurgaon, Beauty Services at Home Gurgaon, Beauty Services at Home Gurgaon, Salon Service at Home Gurgaon, Salon Service at Home Sushant Lok1, Beauty Services in Gurgaon, Beauty Services Gurgaon , Doorstep Beauty Service in Gurgaon, Doorstep Beauty Service Gurgaon , Beauty Service Gurgaon, Beauty Service in Gurgaon, Salon Service Gurgaon , Salon Service in Gurgaon, Beauty Services at Home in Gurgaon, Beauty Services at Home in Delhi, Doorstep Beauty Service at Home in Gurgaon, Doorstep Beauty Service at Home in Delhi, Salon Service At Home in Gurgaon, Salon Service At Home in Delhi, Beauty Services at Home Gurgaon, Beauty Services at Home Delhi, Salon Service at Home Gurgaon, Salon Service at Home Delhi, Beauty Services at Home in Delhi, Beauty Services at Home in Delhi, Doorstep Beauty Service at Home in Delhi, Doorstep Beauty Service at Home in Delhi, Salon Service At Home in Delhi, Salon Service At Home in Delhi, Beauty Services at Home Delhi, Beauty Services at Home Delhi, Salon Service at Home Delhi, Salon Service at Home Delhi, Beauty Services in Delhi, Beauty Services Delhi, Doorstep Beauty Service in Delhi, Doorstep Beauty Service Delhi, Beauty Service Delhi, Beauty Service in Delhi, Salon Service Delhi, Salon Service in Delhi, Beauty Services at Home in Sushant Lok, Beauty Services at Home in Sushant Lok, Doorstep Beauty Service at Home in Sushant Lok, Doorstep Beauty Service at Home in Sushant Lok, Salon Service At Home in Sushant Lok, Salon Service At Home in Sushant Lok, Beauty Services at Home Sushant Lok, Beauty Services at Home Sushant Lok, Salon Service at Home Sushant Lok, Salon Service at Home Sushant Lok, Beauty Services in Sushant Lok, Beauty Services Sushant Lok, Doorstep Beauty Service in Sushant Lok, Doorstep Beauty Service Sushant Lok, Beauty Service Sushant Lok, Beauty Service in Sushant Lok, Salon Service Sushant Lok, Salon Service in Sushant Lok, Beauty Services at Home in Sushant Lok 2 Gurgaon, Beauty Services at Home in Sushant Lok 2 Gurgaon, Doorstep Beauty Service at Home in Sushant Lok 2 Gurgaon, Doorstep Beauty Service at Home in Sushant Lok 2 Gurgaon, Salon Service At Home in Sushant Lok 2 Gurgaon, Salon Service At Home in Sushant Lok 2 Gurgaon, Beauty Services at Home Sushant Lok 2 Gurgaon, Beauty Services at Home Sushant Lok 2 Gurgaon, Salon Service at Home Sushant Lok 2 Gurgaon, Salon Service at Home Sushant Lok 2 Gurgaon,Beauty Services in Sushant Lok 2 Gurgaon, Beauty Services Sushant Lok 2 Gurgaon, Doorstep Beauty Service in Sushant Lok 2 Gurgaon, Doorstep Beauty Service Sushant Lok 2 Gurgaon, Beauty Service Sushant Lok 2 Gurgaon, Beauty Service in Sushant Lok 2 Gurgaon, Salon Service Sushant Lok 2 Gurgaon, Salon Service in Sushant Lok 2 Gurgaon, Beauty Services at Home in Sushant Lok 1 Gurgaon, Beauty Services at Home in Sushant Lok 1 Gurgaon, Doorstep Beauty Service at Home in Sushant Lok 1 Gurgaon, Doorstep Beauty Service at Home in Sushant Lok 1 Gurgaon, Salon Service At Home in Sushant Lok 1 Gurgaon, Salon Service At Home in Sushant Lok 1 Gurgaon, Beauty Services at Home Sushant Lok 1 Gurgaon, Beauty Services at Home Sushant Lok 1 Gurgaon, Salon Service at Home Sushant Lok 1 Gurgaon, Salon Service at Home Sushant Lok 1 Gurgaon,Beauty Services in Sushant Lok 1 Gurgaon, Beauty Services Sushant Lok 1 Gurgaon, Doorstep Beauty Service in Sushant Lok 1 Gurgaon, Doorstep Beauty Service Sushant Lok 1 Gurgaon, Beauty Service Sushant Lok 1 Gurgaon, Beauty Service in Sushant Lok 1 Gurgaon, Salon Service Sushant Lok 1 Gurgaon, Salon Service in Sushant Lok 1 Gurgaon, Beauty Services at Home in Sushant Lok 1, Beauty Services at Home in Sushant Lok 1, Doorstep Beauty Service at Home in Sushant Lok 1, Doorstep Beauty Service at Home in Sushant Lok 1, Salon Service At Home in Sushant Lok 1, Salon Service At Home in Sushant Lok 1, Beauty Services at Home Sushant Lok 1, Beauty Services at Home Sushant Lok 1, Salon Service at Home Sushant Lok 1, Salon Service at Home Sushant Lok1, Beauty Services in Sushant Lok 1, Beauty Services Sushant Lok 1 , Doorstep Beauty Service in Sushant Lok 1, Doorstep Beauty Service Sushant Lok 1 , Beauty Service Sushant Lok 1, Beauty Service in Sushant Lok 1, Salon Service Sushant Lok 1 , Salon Service in Sushant Lok 1, Beauty Services at Home in Sector 57, Gurgaon, Beauty Services at Home in Sector 57, Gurgaon, Doorstep Beauty Service at Home in Sector 57, Gurgaon, Doorstep Beauty Service at Home in Sector 57, Gurgaon, Salon Service At Home in Sector 57, Gurgaon, Salon Service At Home in Sector 57, Gurgaon, Beauty Services at Home Sector 57, Gurgaon, Beauty Services at Home Sector 57, Gurgaon, Salon Service at Home Sector 57, Gurgaon, Salon Service at Home Sushant Lok1, Beauty Services in Sector 57, Gurgaon, Beauty Services Sector 57, Gurgaon , Doorstep Beauty Service in Sector 57, Gurgaon, Doorstep Beauty Service Sector 57, Gurgaon , Beauty Service Sector 57, Gurgaon, Beauty Service in Sector 57, Gurgaon, Salon Service Sector 57, Gurgaon , Salon Service in Sector 57, Gurgaon, Beauty Services at Home in Sector 57 Gurgaon, Beauty Services at Home in Sector 57 Gurgaon, Doorstep Beauty Service at Home in Sector 57 Gurgaon, Doorstep Beauty Service at Home in Sector 57 Gurgaon, Salon Service At Home in Sector 57 Gurgaon, Salon Service At Home in Sector 57 Gurgaon, Beauty Services at Home Sector 57 Gurgaon, Beauty Services at Home Sector 57 Gurgaon, Salon Service at Home Sector 57 Gurgaon, Salon Service at Home Sushant Lok1, Beauty Services in Sector 57 Gurgaon, Beauty Services Sector 57 Gurgaon , Doorstep Beauty Service in Sector 57 Gurgaon, Doorstep Beauty Service Sector 57 Gurgaon , Beauty Service Sector 57 Gurgaon, Beauty Service in Sector 57 Gurgaon, Salon Service Sector 57 Gurgaon , Salon Service in Sector 57 Gurgaon.